Thanks to the Cassini mission we’ve known about the jets of icy brine spraying from the south pole of Saturn’s moon Enceladus for about 8 years now, but this week it was revealed at the 44th Lunar and Planetary Science Conference outside Houston, Texas that Enceladus’ jets very likely reach all the way down to the sea — a salty subsurface sea of liquid water that’s thought to lie beneath nearly 10 kilometers of ice. Enceladus’ jets were first observed by the Cassini spacecraft in 2005. The jets constantly spray fine particles of ice into space which enter orbit around Saturn, creating the hazy, diffuse E ring in which Enceladus resides. Emanating from deep fissures nicknamed “tiger stripes” that gouge the 512-km (318-mile) -wide moon’s south pole the icy jets — and the stripes — have been repeatedly investigated by Cassini, which has discovered that not only do the ice particles contain salts and organic compounds but also that the stripes are surprisingly warm, measuring at 180 Kelvin (minus 135 degrees Fahrenheit) — over twice as warm as most other regions of the moon. Where the jets are getting their supply of liquid water has been a question scientists have puzzled over for years. Is friction caused by tidal stresses heating the insides of the stripes, which melts the ice and shoots it upwards? 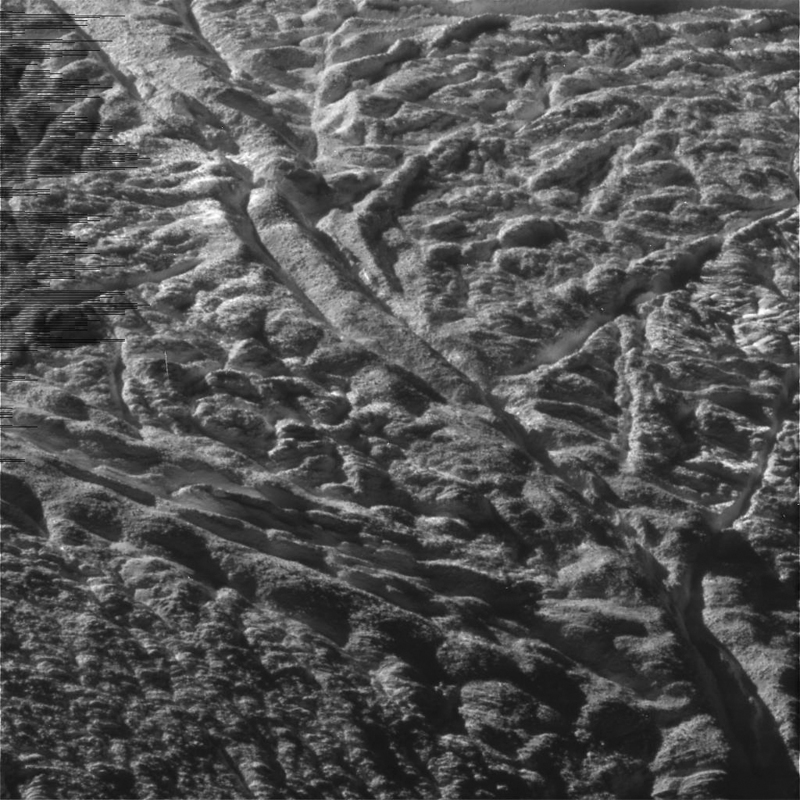 Or do the fissures actually extend all the way down through Enceladus’ crust to a subsurface ocean of liquid water, and through tidal pressure pull vapor and ice up to the surface? Researchers are now confident that the latter is the case. In a presentation at the Lunar and Planetary Science Conference titled “How the Jets, Heat and Tidal Stresses across the South Polar Terrain of Enceladus Are Related” (see the PDF here) Cassini scientists note that the amount of heating due to tidal stress seen along Enceladus’ tiger stripes isn’t nearly enough to cause the full spectrum of heating observed, and the “hot spots” that have been seen don’t correlate with the type of heating caused by shear friction. Instead, the researchers believe that heat energy is being carried upwards along with the pressurized water vapor from the subsurface sea, warming the areas around individual vents as well as serving to keep their channels open. With 98 individual jets observed so far on Enceladus’ south polar terrain and surface heating corresponding to each one, this scenario, for lack of a better term… seems legit. What this means is that not only does a moon of Saturn have a considerable subsurface ocean of liquid water with a heat source and Earthlike salinity (and also a bit of fizz) but also that it’s spraying that ocean, that potentially habitable environment, out into local space where it can be studied relatively easily — making Enceladus a very intriguing target for future exploration. – Cassini imaging team leader Carolyn Porco et al. Research notes via C. Porco, D. DiNino, F. Nimmo, CICLOPS, Space Science Institute at Boulder, CO, and Earth and Planetary Sciences at UC Santa Cruz, CA. Top image: color-composite of Enceladus made from raw Cassini images acquired in 2010. The moon is lit by reflected light from Saturn while the jets are backlit by the Sun.